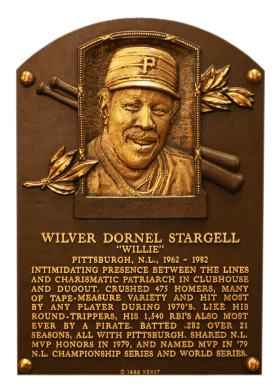 One of the strongest players ever, Willie Stargell made tape-measure homers common. He had 13 consecutive years of 20 or more home runs, pacing the NL in 1971 and 1973. He was named season, NLCS, and World Series MVP in 1979, when he led the world champion Bucs. He had 475 career homers and 1,540 RBI. Comments: I had a mint 1969 Topps card in this position for many years, purchasing a SGC-graded 96 example in Jan, 1999. I also had a 1969 Topps card for Al Lopez. So, I decided to swap out the Stargell with a different card. I found a 1967 Topps Pirates Sticker in PSA 8 on eBay in Jan, 2008. 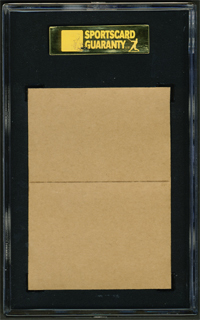 I upgraded to a SGC 96 in Jan, 2010 with a Buy It Now on eBay from BMW Sportscards. I overpaid a little because, another copy showed up a week later, and sold for a little less. A mint copy wasn't available via auction or eBay for two weeks and then two show up in one week. That's how it goes sometimes. 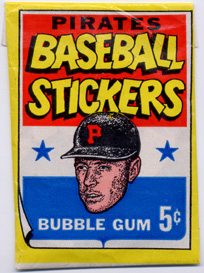 Description: Considered a "test" issue, this 33-sticker set of 2-1/2" X 3-1/2" stickers is very similar to the Red Sox stickers which were produced the same year. Player stickers have a color picture (often just the player's head) and the player's name in large "comic book" letters. 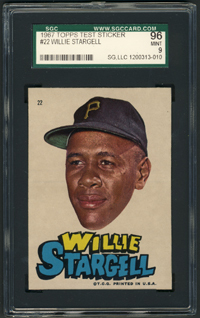 Besides the players, there are other topics such as "I Love the Pirates," "Bob Clemente for Mayor," and a number of similar sentiments.